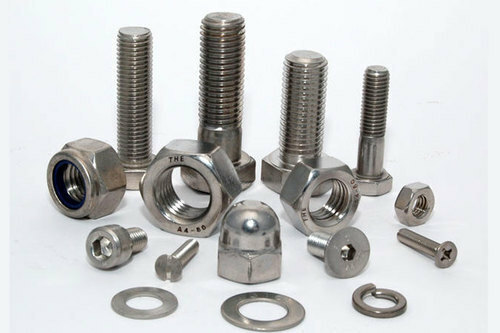 We are a leading Exporter of inconel fasteners from Mumbai, India. Fasteners Nut, Bolt, washers, studs, etc. Our range of Inconel Fasteners are developed from quality checked metal in diverse dimensions and offered by us at economical values. Our expertise lies in designing these inconel fasteners in customized sizes as required and specified by our clients. Bolts: Stud bolts, hex head bolts, socket hexagon head screw anchor bolts, u-bolts, j bolts, mushroom head square neck bolts, t- head bolts, wing screw, eye bolt, eye bolt, foundation bolts, structural bolts. Washer: Plain washer, plain big & small od washer, spring lock washer, spring washer heavy duty, tooth washer, star washer, tab washer with one & two tab. Nuts: Hexagon nuts, hexagon coupling nuts, hexagon thin nut, square nut, hexagon castle nuts, self locking nut, hexagon domed cap nuts. Screw: Pan head slotted screws, cheese head slotted screws, countersunk head slotted screws, countersunk raised head slotted screws, pan phillipse head screw, countersunk phillipse raised head screws, slotted cheese trim head machine screws, socket head allen cap screws, allen countersunk socket head cap screws, socket head shoulder screws, socket head cap screw low head, hexagon socket set screw with flat point, hexagon socket set scews with cone point, hexagon socket set screw with dog point, hexagon socket set screws with dog point, hexagon socket set screws with cup point , imprial socket cap screws. Other Details: Threaded rod, as per drawing and customers spec.